Before you start an assessment, please read all of the information below. If you are having an asthma attack then please call NHS 111 for urgent advice or 999 if your symptoms are severe. Asthma is a condition that results in a person's airways to be 'sensitive' causing them to react to certain triggers. The symptoms of asthma are caused by swelling of the airways making them narrow, therefore getting air in and out of the lungs becomes more difficult. 1. the muscles surrounding the walls of the airways tighten. 2. the lining of the airways become swollen. 3. sticky mucus can build up in the airways. A typical person with asthma may take a preventer inhaler every day to reduce the likelihood of symptoms developing and use a reliever inhaler such as Ventolin ( the blue inhalers ) as and when required if symptoms flare up. Please see the Common Treatments section below for further information. As asthma is a condition that may become serious quickly if not managed correctly, it is important that your GP can monitor your condition. For this reason, we can only prescribe asthma treatment if you consent to sharing your prescription request with your GP. Please click on the medication above to read the Patient Information Leaflet for important information about each inhaler. Your asthma can become worse if you do not manage it properly or take your medicines as prescribed. See your asthma nurse or GP for an asthma review to ensure it is being managed correctly. This should be at least once a year. A written asthma plan will help you identify when your asthma may need extra help, and how to manage it if your symptoms worsen. You can download an Asthma Action Plan from Asthma UK. There's good evidence to show that a written asthma action plan is the best thing you can do to manage your asthma. It can help reduce your risk of being admitted to a hospital by four times. A preventer inhaler will help to keep your symptoms under control and reduce your airways reaction to trigger factors. This will help you to be aware if your symptoms are getting worse. If you smoke, it can often lead to recurrent chest infections and worsening of your asthma. Quitting is likely to help improve your asthma control. You can find out more about the options available to help you stop, on NHS Choices here. Inhalers are often used incorrectly. Using your inhaler in the right way is very important to ensure that the medication enters the lungs where you need it, instead of ending up in your throat. If you're not sure how to use your inhaler, or you have not had your technique checked for a year, ask your pharmacist, nurse or doctor to supervise this. They can ensure that you use it correctly. Please go to Asthma UK for more detailed advice and videos for using different inhalers. When using a pressurised metered dose inhaler please remember the following advice. Remove the mouthpiece cover fully, shake the inhaler to remove loose objects that may not be visible, and check the inside and outside of the mouthpiece are clear before inhaling a dose. To prevent objects from entering the mouthpiece during storage, remember to replace the cover immediately after use, ensuring it clicks into place. This is because there have been reports of patients who have inhaled objects into the back of the throat. Salbutamol is a 'reliever' and works by relaxing the muscles of the airways which makes it easier to breathe. It should be taken only when it is needed, 1-2 puffs up to a maximum of 4 times in 24 hours. It should give you quick relief from breathing problems caused by your asthma. If you have a sudden asthma attack, then you can take more salbutamol. You can take up to 10 puffs, but you should shake the inhaler and wait 30 seconds between doses. You can repeat this dose 10 minutes later. Before you start the treatment, please read the manufacturers leaflet contained with the medication. This contains more information and diagrams to show you how to use the inhaler, how to keep it clean, how long to use it before getting a replacement and lists all the potential side effects. If you are using your salbutamol inhaler more than three times a week, it could be a sign that your asthma is not well controlled. It is important to speak with your nurse doctor or pharmacist to review your asthma control. Your salbutamol inhaler works almost straight away once you take a puff helping to make your breathing easier. It will continue working for about 5 hours. If Salbutamol makes you feel dizzy or shaky then do not drive, cycle or use tools or machinery until you feel better. You can drink alcohol with salbutamol. Salbutamol is safe and a very effective medication if you use it properly. It does not have many side effects. These side effects usually settle quickly and are not dangerous. Some of the common side effects of salbutamol will lessen as your body gets used to it. Speak to your pharmacist, doctor or contact us if they continue to bother you. Serious side effects are rare, but if you notice any of the following, then please seek urgent medical advice. If you have any of the following, then Salbutamol is not suitable for you. An asthma attack is an emergency. Getting treatment quickly could save your life. 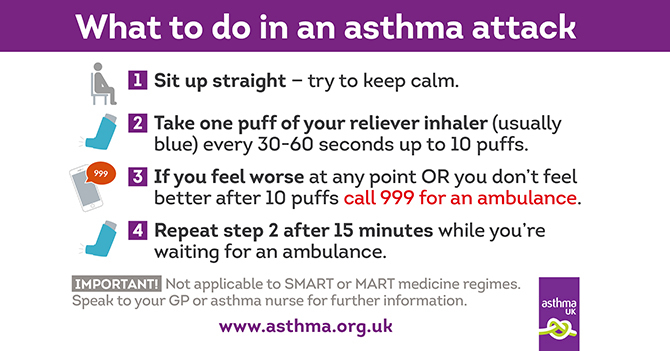 Call 999 or go to the hospital immediately if you feel you are having an asthma attack. If you develop any of the symptoms listed below, then you must seek urgent medical advice immediately (from your GP, Out of Hours Service, Urgent care centre, NHS 111). Call an ambulance or go to A&E if the symptoms are severe. If you feel worse or develop any of the symptoms below, then it is important to seek medical advice as soon as possible from your GP, Out of Hours Service, Urgent care centre, NHS 111). Call an ambulance or go to A&E if the symptoms are severe. If you develop a high-grade fever (high temperature) which can cause shivers. If your cough becomes worse. If you feel increasingly unwell (this may include nausea and vomiting). Asthma UK has devised a free 12-week support programme for people with Asthma in living in the UK. It involves 12 weeks of expert advice, tips and personalised asthma support activities sent straight to your smartphone. It is based on guidance provided in the NHS, and is designed to help you better understand your asthma, and how it affects you. Check the Asthma UK website to find out when the next sign up is. Do you require a repeat prescription of your Ventolin (blue) inhaler? We could send you a treatment plan with a prescription, if appropriate, within an hour and you can collect it from your local pharmacy.